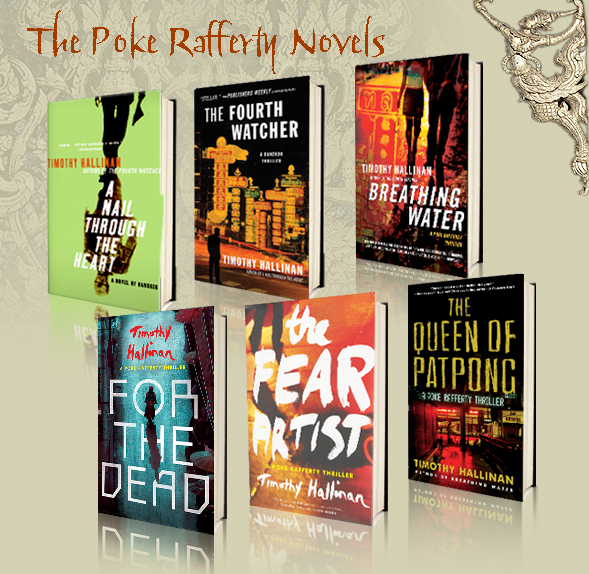 If you’ve read any of the first five Poke Rafferty Bangkok Thrillers by Timothy Hallinan chances are you became a fan of the series. You do not get the Edgar Award, Macavity Award and Shamus Award nominations and have NBC develop your Junior Bender novels into a television series by Tweeting. You do have to write at least sixteen novels, though, plus a lessor known fact, Tim Hallinan has written a book of non-fiction on the works of Charles Dickens. For The Dead is now available for pre-order at Amazon.com and will be available at quality bookshops beginning November 4, 2014 – just two weeks from today. One of the more enjoyable posts I have ever written on Thailand Footprint and one of the most consistently read is titled: The Poke Rafferty Series by Timothy Hallinan – King of the Bangkok Fiction Hill? 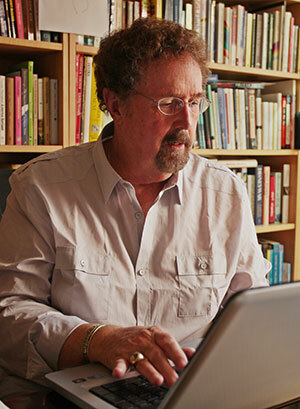 There I discuss Tim’s first five novels in the Poke series. They are in order: A Nail Through The Heart; The Fourth Watcher; Breathing Water; The Queen of Patpong and The Fear Artist. Miaow, she thinks. The throw-away child, tossed onto a side-walk. As tough as she tries to seem, Miaow worries about everything. She double-checks everything. If she were hanging over a cliff, held only by a knotted rope, she would try and improve the knot. She has no idea how remarkable she is, how smart, how decent, how much she’s loved. Somewhere in the center of her being, Miaow is still the short, dirty, dark-skinned, frizzy-haired, unloved reject who tried to sell chewing gum to Rafferty on his second night in Bangkok. For The Dead opens with a wonderful upcountry dream sequence. It concludes with heart-tugging laughter. What you get in-between, besides a fast paced thriller featuring technology, pulse pounding chase scenes and contract killings conducted at the highest levels by a corrupt Thai Police force, is what is missing in so many novels today: quality. Page after page of quality. What you read in a Timothy Hallinan novel has importance, it’s useful and it’s entertaining. In For The Dead, Poke is happy, financially secure for once and learns that his family of three will in nine months time become four. Miaow helps her nerdish Vietnamese boyfriend replace his second lost iPhone with a used model during a skillful negotiation process with a Sikh merchant on a skipped day of school in India Town. They learn later the phone contains pictures of some very dead policeman. Poke would normally be an early confidant but news of Rose’s pregnancy was relayed in an awkward manner, creating domestic strife. Serious jeopardy ensues and leads to the heaviest of hit men. You could make a good case that in the Poke Rafferty series the last three novels have been the best, although I very much enjoyed Breathing Water. For me, The Queen of Patpong had the perfect mix of thrills, antagonist and family. In The Fear Artist, I found myself missing the family at times, although again the thrills and antagonist were stellar, plus you got the intriguing character of Treasure, whom we last saw disappearing into the fire and explosions of her abusive home. For The Dead puts Poke and family front and center, plus Treasure gets an encore along with two memorable Bangkok street kids. The thrills are still there as is the terrific prose of Hallinan detailing in great depth the best and worst of mankind. My criticism of For The Dead is the antagonist didn’t live up to the level of evil or consistency of the last two, but Hallinan can take the blame for that one, for setting the bar so high. My suspension of disbelief also had to be ratcheted up a notch for a rather conveniently timed plot solution, no matter how much I wanted it to happen. The Queen of Patpong is a Bangkok Thriller. My favorite Bangkok thriller of all-time. The Poke series is a Bangkok series when looked at in totality. For The Dead is, first and foremost, a human story – a story about a family and the bonds that hold them together.A story that could play within the backdrop of a dozen cities throughout the world – the corrupt police department and poor rice farmers notwithstanding. And that is not a criticism; that is a compliment to the story-telling ability and the multi-dimensional characters that Hallinan constructs in his writing. The Poke Rafferty series is no longer confined to the genre of Bangkok fiction or a simple mystery – this is first class literary fiction. We are reminded often that we now live in a world where books, music, authors and musicians have all been devalued. But value is still out there if value matters to you. Smart and appreciative readers will always invest in reading good books by good authors. 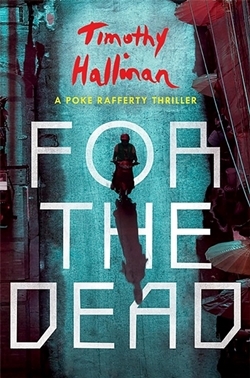 For The Dead is one such book and Timothy Hallinan has proven time and time again that he is one such author. Thanks, Trevor. I agree, HANSUM MAN was a standout in BANGKOK NOIR. Interestingly, The Fourth Watcher was my least favorite and I acknowledge in the earlier review that I never finished it. So do give “The Queen of Patpong” a go. It’s a ripper of yarn at the end. Kind of mellow in the middle.